Please take Interstate 5 north, approximately 16 miles. Exit at Del Mar Heights Road, and turn right (east) off the freeway. About 0.6 miles turn left at El Camino Real and travel for 1.9 miles. Then turn right at San Dieguito Road; proceed 2.7 miles. Turn right at Rancho Diegueno Road. Turn left (immediately) at Rancho Valencia Road, 0.5 miles. Pass Rancho Valencia Resort and slight left at Circo Diegueño Road. 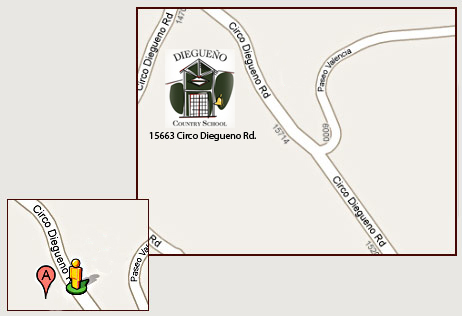 Our school is .03 miles on the left on Circo Diegueno Road. Please note there is limited parking in front. Take Interstate 5 south. Exit at Via de la Valle, turn left, go 1.5 miles and turn right at El Camino Real. Drive 0.5 mile and turn left at San Dieguito Road. Proceed 2.7 miles and turn right at Rancho Diegueño Road. Turn left (immediately) at Rancho Valencia Road, 0.5 miles. Pass Rancho Valencia Resort and slight left at Circo Diegueño Road. Our school is .03 miles on the left on Circo Diegueño Road.